Microanalysis has recently acquired an Agilent 7890 GC-MS (Gas Chromatogram – Mass Spectrometer) for its new premises at East Perth. A means of introducing the sample via an injection port. The separation of mixtures of compounds by partitioning them between a gas phase (typically helium) and an activated solid phase attached to a silica capillary column. The difference in the chemical properties between different molecules in a mixture and their relative affinity for the stationary phase of the column will promote separation of the molecules as the sample travels the length of the column. The molecules are retained by the column and then elute (come off) from the column at different times (called the retention time). As the helium gas phase containing the molecules passes through the mass spectrometer, they are ionised into fragments and detected based on their mass charge ratio. The fragment pattern can be match to an internal library to provide the absolute identification of a compound. 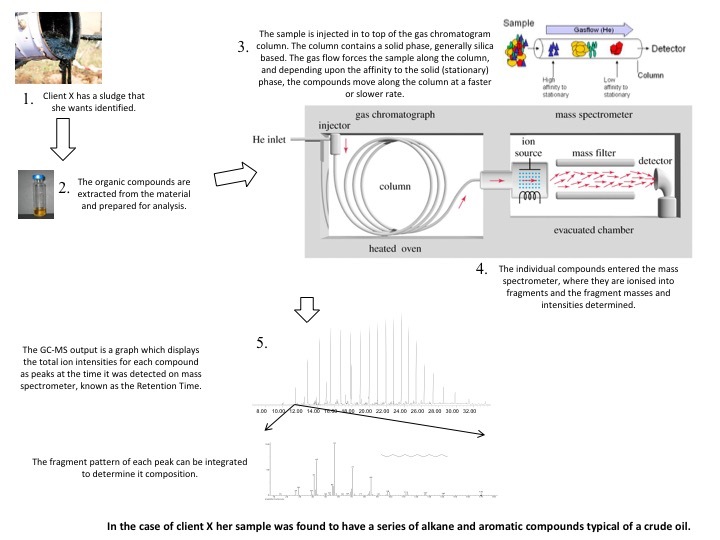 The true power of the GC-MS is when the information of the retention time and mass fragment patterns are combined to allowed the identification of compounds in extremely complex samples such as crude oils, as well as enabling the detection of pesticides, PCB and PAHs down to ppb or even ppt levels. The diagram below provides a summary of how a typical sample would be analysed on this system.